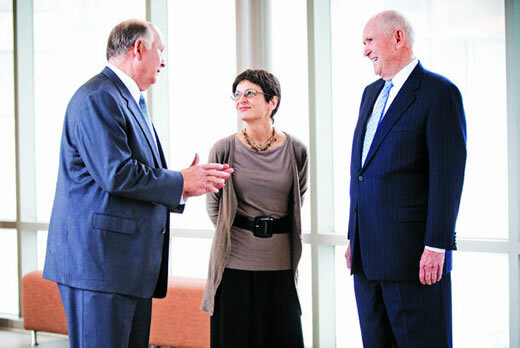 Gary (left) and Randall Rollins talk with Rollins Professor Viola Vaccarino about her research in cardiovascular epidemiology. Rollins School of Public Health received a gift of $2 million from the O. Wayne Rollins Foundation and the Rollins family to fund the Wilton Looney Chair of Cardiovascular Research. The endowed chair is named in honor of Wilton Looney, honorary chair of the Genuine Parts Company Board and long-time director of Rollins Inc. The gift is the most recent expression of the Rollins family’s extraordinary investment in the school that bears their name. "We are honored to receive this very generous gift from the Rollins family," says James Curran, MD, MPH, dean of the Rollins School of Public Health. "Their commitment to supporting research addressing one of the leading causes of death in the U.S. and the world is yet another indication of their understanding of public health and our mission to prevent disease, save lives and train the next generation of public health leaders." Viola Vaccarino, professor and chair of the Department of Epidemiology, will be the first to hold the prestigious Wilton Looney Chair of Cardiovascular Research. A leading cardiovascular epidemiologist, Vaccarino is nationally and internationally recognized for her work on cardiovascular disease prevention. A focus of her research is the role of behavioral and psychological determinants of cardiovascular disease and their interplay with genetic and other biological factors in modulating cardiovascular risk. Vaccarino is the author of over 250 research publications and has an extensive record of research funding from the National Institutes of Health. She has trained and mentored numerous graduate students, postdoctoral fellows and junior faculty members in the area of cardiovascular epidemiology and prevention. Vaccarino holds a joint appointment in the Division of Cardiology at the Emory School of Medicine. "It is a great privilege to have been selected as the first Wilton Looney Professor in Cardiovascular Research," says Vaccarino. This tremendous recognition will allow me to continue and expand my research and teaching activities in the area of cardiovascular epidemiology and prevention. It will also go a long way toward the Rollins School of Public Health’s recognition as a center of excellence in this important field. This generous endowment motivates me and my students to continue striving toward advancing knowledge for better cardiovascular health." The Rollins family relationship with Emory University began in the 1960s. In 1994, Emory recognized the Rollins’ many years of philanthropy by naming the Rollins School of Public Health in honor of the Rollins family. Rollins’ generosity made possible the school’s first permanent home, the Grace Crum Rollins building, which opened in 1995. In 2007, the family underscored their commitment to the school by pledging the lead gift for the Claudia Nance Rollins Building. Opened in 2010, this building more than doubled the physical size of the Rollins School of Public Health and reflects the family’s vision and desire to ensure that the school has the ongoing capacity to achieve the highest level of excellence in public health. Rollins School of Public Health now ranks sixth among schools of Public Health according to U.S. News and World Report.